Man made COARSE shaping stone. Appropriate to rapid and aggressive removal of nicks and chips or for initial shaping. Silicon carbide. 210 x 55 x 27mm. Man made COARSE shaping stone. Appropriate to rapid and aggressive removal of nicks and chips or for initial shaping. Mounted on pl;astic base, 185 x 63 x 25mm. Man made MEDIUM sharpening stone. Used after shaping (if required) and before FINISHING stones. 207 x 66 x 34mm. Coarse starter stone. Single block unmounted. Man made MEDIUM sharpening stone. Has proprietary composition with 'diamond like' particles. Soft bond and the first grade which will slurry. Used after shaping (if required) and before FINISHING stones. 205 x 70 x 34mm. 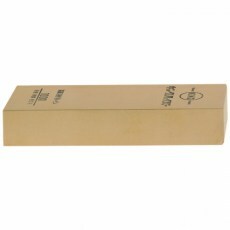 Man made MEDIUM sharpening stone. Used after shaping (if required) and before FINISHING stones. 215 x 75 x 50mm. 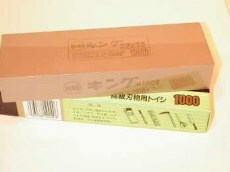 Man made FINISHING sharpening stone. Used after sharpening to put the final polish on the metal. 210 x 73 x 22mm.